The original Inland template is a light and feature-packed multi-layout template with the design in focus, with a simple slideshow and multiple layout options. 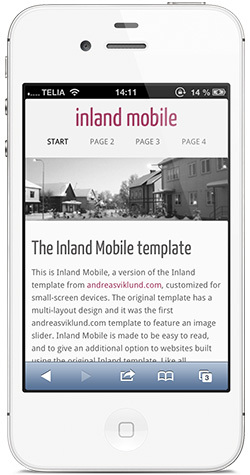 This version, called Inland Mobile, adds a new wrapper and customized styles specifically for small-screen mobile devices. Improved readability and small file sizes are two benefits, if you want to build a site specifically for mobile device visitors. Still, the design matches the original Inland template, which allows combinations for sites with both full-size versions and a mobile version.